A festival that is known as Yi Peng or Yee Peng Festival in Chiang Mai can be a best thing to enjoy. This festival goes three days long. 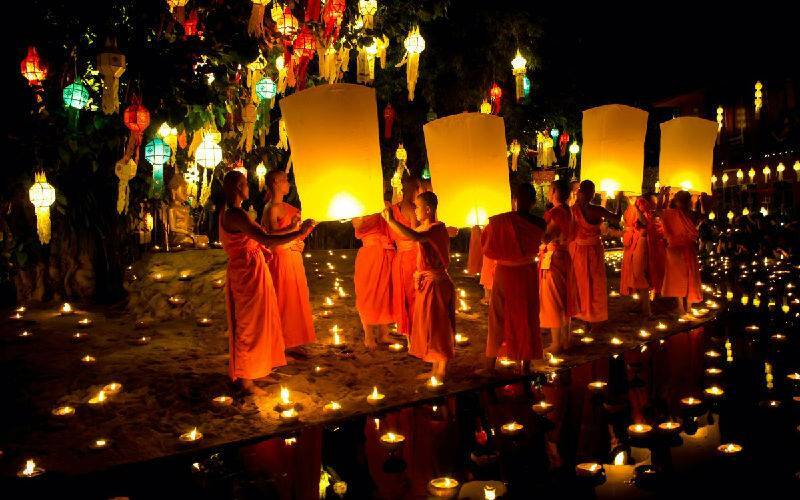 First day of the festival consists of lantern festival, second day is a day of full moon while the third day is known as the day of Loy Krathong parade. In Thailand, Loy Krathong is not a public holiday, that is why most of the activities of this festival starts in the evening. Meaning of word Loy is to float, but Krathong refers to a container of lotus shaped which can float on the surface of water easily. you can find a Krathong beautifully decorated with the folded leaves of banana, candles and incense sticks. If you want to release your Krathong basket, it is better to head to the ping river. You can reach to the ping river easily by following some locals there. Before putting the basket in to water, light the sticks, blow the candles then make a wish and place your basket on the surface of river water with care. People there have a believe that if you are going to place a strand of hair, a coin or clipping of a nail into the basket before putting the basket into water, it will keep the bad and negative things away from your life. Keep in mind the thing that you do not need to light the stick or blow the candle before the time. Light the stick and candle at the time of releasing the Krathong basket. One of the best part of this festival is that you are going to release the sky lantern by staying within the city. During the time of preparations of the Yi Peng or Yee Peng Festival, people used to create the sky lantern and place them outside their houses or most often they donate these lantern to any of temple, they believe that this can let the darkness away from their lives and can welcome a bright future for them. On the night time of Yi Peng or Yee Peng Festival people release the sky lantern into the sky after making a wish of blessed future for themselves. People in Chiang Mai believe that if your sky lantern stays lighted till the time you can see that, it means that your wish is going to be true soon. Well briefly, at the second night of Yi Peng or Yee Peng Festival you can enjoy the release of a large number of wish lanterns in the sky. Most of the videos and images that you can find of this event are from the Lanna Dhutanka temple that is situated near Mae Jo University, which is almost 15 km away in the north side of Chiang Mai. 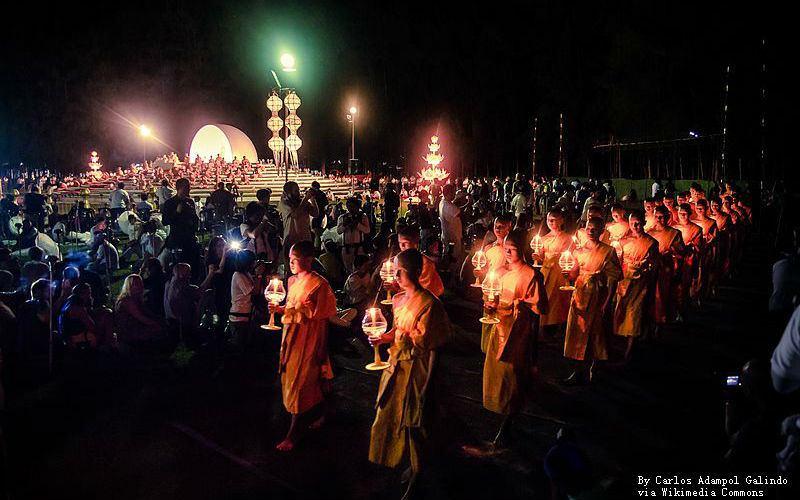 This side of Buddhist sector in Chiang Mai organize this event every year. In the past years this event was free to attend for everyone, but now you have to pay from 100 to 300 USD dollars for each person of your family or group to get an entry ticket for the event. Tickets of this event are really hard thing to get. So, if you are thinking about to visit this festival it is better to grab the entry tickets of this festival as soon as possible. Well, a better destination for enjoying this event is Nawarat Bridge that extents to the Ping River. You can capture a picture with the sky lantern of any local person, but it is better to enjoy the festivity of event by releasing the sky lantern by yourself. At Wat Phan Tao you can experience an amazing event, an old Buddhist temple is located in the Old city in Chiang Mai. On the night of full moon, garden of this old temple is being decorated with huge number of colorful lanterns and the garden is illuminated with hundreds of candles, this can give you an amazing view to enjoy. Young monks come out to release the lanterns from the temples. They put thee lanterns in the water to flow and suddenly that flow can be stopped. Oh no! it is not because of any kind of super powers, lanterns are suspended actually to make the ceremony more beautiful. If you want to be a part of this beautiful evening, then it is recommended for you to reach at the destination place hours ago. Otherwise you may not be going to get a space to enjoy this amazing event. Although the event starts at 8:00 pm but people starts to reach there at least 3 to 4 hours ago. When the sky is covered with the sky lanterns and Krathongs baskets are floating on the water surface the entire Thailand get a feel of joy. Noppamas Beauty Contest can be the best attraction for tourists there, in this event Princess Srijuralak appears with the first person who create the first Loy Kratong lantern. This event can be the one of some days that Thais celebrates for themselves. You can find many of Thai locals performing different cultural dance and music performances.